Despite their fur coat coverings, many dogs have sensitive skin that can become inflamed, bumpy and crusty due to a variety of factors. Bug bites, fungal infections, allergies and other skin conditions can cause a change in the texture of your dog's skin. Most issues are treated easily. If you find Fido scratching excessively, take him to your vet for a checkup. Dog being examined by a vet. Ringworm is a contagious fungal infection that can be passed between people and animals. It presents as raised, red or pink circular lesions with a pale or crusty center. Ringworm is itchy and uncomfortable and spreads quickly. See your vet as soon as you notice the symptoms. He'll likely prescribe an anti-fungal medication for your dog and advise you to use gloves and protective clothing when handling your pooch to prevent transmission. Scabies, or sarcoptic mange, is another contagious skin problem that can be passed from one animal to another. Scabies appear as red bumps with a hardening or scaling of the skin. The condition is very itchy and dogs may scratch to the point of opening their skin and exposing themselves to infection. Treatment typically includes lime-sulfur dip or a prescription medication containing fipronil or selamectin. 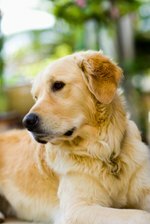 Some dogs are allergic to the saliva found in flea bites and develop flea allergy dermatitis. Bites become raised, red and crusty and can be itchy. The first step to treating flea allergy dermatitis is to eradicate the fleas. Your vet may recommend a flea dip or bath with medicated shampoo. All bedding will have to be washed in hot water and carpets and upholstery vacuumed thoroughly to eradicate flea eggs. Skin is usually treated with corticosteroids. Some skin infections present as raised bumps that can be crusty or weepy. Contact dermatitis occurs when your dog brushes against something that irritates his skin, such as a plant, lawn chemical or household product that doesn't agree with him. Yeast and bacterial infections can develop on various parts of the body and typically occur when water or debris is trapped in skin crevasses. Most are treated with anti-fungal meds or antibiotics. Vets can diagnose many common skin conditions through visual inspection, though in some cases skin swabs may need to be viewed under a microscope. Your vet also may recommend blood tests, particularly if a viral or bacterial infection is suspected. Large bumps or lesions that could be cysts or tumors may be biopsied for evaluation.